A very good month of reading in December. Some excellent reads. 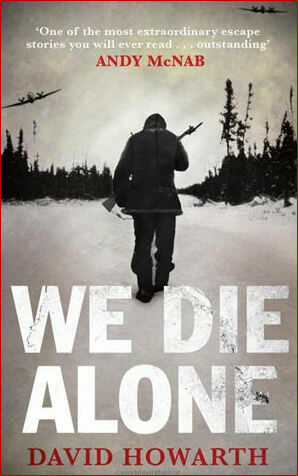 The book that stood out for me though was We Die Alone by David Howarth. A remarkable tale, that if a work of fiction would be dismissed as unbelivable. An amazing story of survival against all odds. 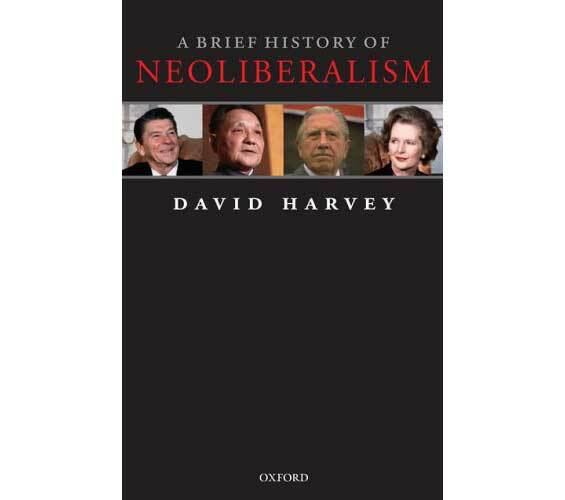 Harvey does an admirable job of explaining the logic of neoliberalism and in detailing a history of how its ideas have come to prominence in a number of countries. 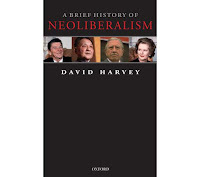 Whilst Harvey demonstrates the ways in which neoliberalism has unfolded in a variety of ways in a selection of countries, the story would have benefited from a more systematic analysis of the varieties of neoliberalism working across and within countries. Indeed, a scalar analysis from the local to the global would have been a useful addition to the text. That said, for anyone wanting a good overview of neoliberalism, this is a very useful introductory text. It also predicted the present global financial crash and explains why it was an inevitable outcome of free market financial capitalism, sustained by a political economic ideology that prioritized the interests of the market and corporations at all costs. From an Irish perspective, anyone trying to understand why the Irish economy collapsed and why the banks and the bond holders have been prioritized over citizens this book provides a compelling starting point to an explanation. Bull O’Kane, paramilitary leader and master criminal on both sides of the Irish border, has been reduced to a bitter old man living in a convalescence home run by his daughter due to an entanglement with Gerry Fegan, a former IRA man who turned on his former comrades. His pride seriously dented, O’Kane wants Fegan and everyone who witnessed his demise to be wiped from the face of the Earth. To that end he hires The Traveller, a compassionless assassin, to kill everyone present on his farm the day Fegan wreaked his deadly havoc. Killing O’Kane’s former employees is relatively straightforward, but Fegan, Maria and her daughter, Ellen, have disappeared. Only Maria’s father is dying after a stroke, meaning she’s likely to break cover to travel back to Belfast to see him before he dies. And if they travel back, then Fegan will inevitably be drawn back to protect them. The troubled Inspector Lennon has his own reasons for wanting to see them, as Maria is his former partner and Ellen the daughter he barely knows. Aware that his daughter might be in danger, Lennon is desperately trying to track them down, his own colleagues trying to divert and slow his progress. At one level, Collusion is a fairly straightforward thriller – The Traveller hunts down O’Kane’s victims and Fegan and Lennon try to stop him. It rises above average fare though by being a multilayered tale with noir sensibilities – no real heroes or neat resolutions, just people with complex, troubled and intertwined histories. The writing is excellent, with well constructed prose and scenes. The characterisation is strong and the plotting sound, with pages flying by as the end nears. I would have liked a bit more backstory and time with some of the characters, and a little more plot elaboration in places, but that’s just personal taste. 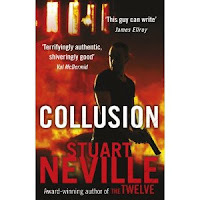 And, although it’s not essential to read The Twelve, Neville’s previous novel first, it would certainly help as just about all the characters in Collusion first appear there and this is very much a sequel. Overall, an entertaining read, with the best opening scene I’ve read for a while. Whilst there are a pack of Irish crime writers flourishing at the minute, it’s not clear if one is going to break free and join John Connolly in the mega-sales league. Stuart Neville may well be that writer on the strength of his first two novels. We braved the arctic freeze to do a quick shopping run to town this morning on 4 miles of untreated road. It's been -12 to -15 the last four nights, with the day time temperature not getting about -3 or so. As a result, the six inches of snow that fell last weekend are still here. That might not seem so bad to people used to such weather, but it rarely drops below freezing in Ireland and we are set for our coldest December since records began. Travel over the past few days has turned into chaos. 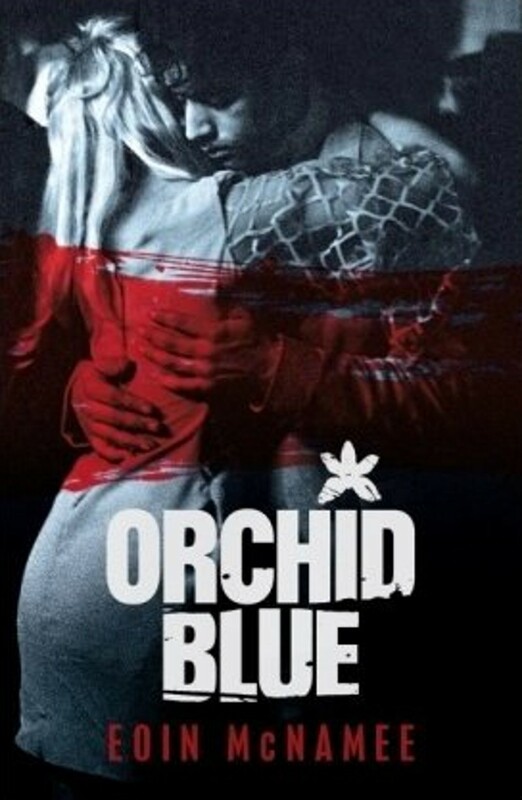 The trip into town gave me an opportunity to duck into the local bookshop and pick up a copy of Eoin McNamee's Orchid Blue, which has been picking up rave reviews (e.g., The Irish Times and The Guardian) . Looks like it might be a seasonal break reading five Irish books in a row, not four. Looking forward to this one, as the other McNamee book that I've read - Resurrection Man was very good. A couple of days ago, Patti over Pattinase posed a question about authors writing fiction using another author’s characters. It’s not really bothered me one way or another and it’s not something I’m particularly interested in doing myself, but we’ve been house bound for the past few days due to the weather, so we’ve been watching some DVDs – Morse and Frost. So Patti's question got me thinking about these series. Whilst some of the episodes are based on the novels of Colin Dexter and R.D. Wingfield, others have been written entirely by other writers using the characters in their own story. The entire run of Frost consists of 38 episodes, yet Wingfield only wrote 6 novels. 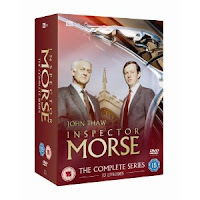 Similarly, there were 33 episodes of Morse but only 13 novels. It’s pretty difficult, to be honest, to know which episodes were based on the novels and which were written by completely different authors. Clearly in TV land, having lots of writers scripting stories using someone else’s creations is not a problem. There seems to be something different about using them in novels, but I’m not really sure what or why? Something about TV not foregrounding the author maybe? An Irish reading challenge is being hosted over on Books and Movies blog. 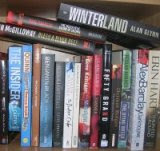 The commitment is to read two, four or six Irish books during 2011. I'd thought I'd give this a plug as you'd really be doing yourself a favour by picking up some Irish crime fiction as there has been loads of good stuff published in the last couple of years and no doubt in 2011 - if you want suggestions try: Declan Burke, Adrian McKinty, Declan Hughes, Arlene Hunt, Tana French, Brian McGilloway, Stuart Neville, Alex Barclay, Gene Kerrigan, Conor Fitzgerald, Eoin McNamee, Ken Bruen, Colin Batemen, Jane Casey, and John Connolly. I'm going to have my own Irish session over the seasonal break. I've made a start on Collusion by Stuart Neville and this will be followed by Pat McCabe's The Stray Sod Country, Ken Bruen's London Boulevard, and Kevin McCarthy's Peeler. All I need to do is shake off this damn flu and I'll be flying through them. The Bishop of Presidente Vargas has flown in a corporate helicopter to the city of Cascatas, in the Brazilian interior, in order to open a new church. On landing he is assassinated by sniper fire. It is one of a number of murders that have happened in Cascatas in recent months, mostly the result of a dispute between the peasants of the Landless League and large landowners who dominate the local economy and wield power over the police and judiciary. In addition, street kids are being found dead on a regular basis. The death of bishop, however, brings Cascatas to the attention of government ministers and the federal police. 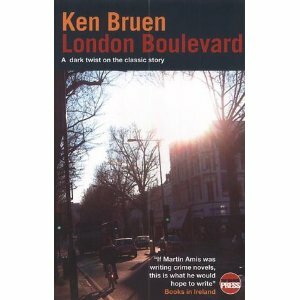 Chief Inspector Mario Silva, a man driven by the need to deliver justice but prepared to twist the law to achieve it, is dispatched to the city. There he is met with resistance by the local state police as he tries to uncover the murderer, but as he picks away at the case, others start to turn up dead, killed by a brutal hand. 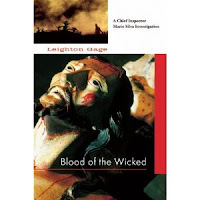 Blood of the Wicked is a crime novel meets social commentary, examining the nature of policing, justice, access to land and a livelihoods, street kids, liberation theology, and massive inequalities in wealth and power in Brazil. It would have been easy for Gage to drift into writing little more than a sermon on corruption and the injustices suffered by the peasant class in country, but he manages to keep the story of the investigation centre stage, with the social commentary drifting out through its telling. And it is a powerful tale, well told. The plotting is, for the most part, excellent, though I did feel the plot line with the journalist was closed off when it could have profitably been kept open and the deaths of several people with powerful connections would have meant the city being flooded with dozens of federal cops, not just Silva and two colleagues. But these are minor gripes. The characterization is strong across a range of characters, not just the principles, and Silva is a detective worth spending time with. Where the book excels is in its evocation of place and its social history and commentary. If you like your fiction to inform and educate as well entertain, then Blood of the Wicked is well worth a read. Thankfully, I managed to get out of London before the airports there were closed due to snow. We were delayed and the plane had to be de-iced, but we did eventually leave. Unfortunately, one of those at the meeting I attended is still stuck there and might be until Wednesday. I returned to a winter wonderland and six inches of snow. Yesterday I discovered an Irish panda whilst playing in the snow with the dogs. Building on floodplains. Can't learn? won't learn? Like Bernadette over at Reactions to Reading I've spent the last couple of years widening my author base having become somewhat tired with the selection in the local bookstores. The result is that of the 99 books I've read so far in 2010, 64 are authors new to me (and I can report this now as I'm not planning on reading any new to me authors between now and the new year). 10 are authors of non-fiction, the rest predominately crime fiction authors. Of these authors, most are contemporary, but I've also been trying to read some of the crime fiction canon. I've finished the Leighton Gage book and the review will go up next week. 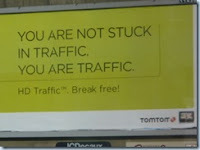 I saw what I thought was a quite profound billboard over a dual carriageway yesterday that declared: ‘You are not stuck in traffic, you are the traffic.’ Ironically it was next to the entrance to an underground station, although it wasn’t advertising public transport, but a satnav to try and avoid congestion (as if that is possible in central London). Regardless, the ‘you are traffic’ bit is a nice line. At the same spot, I found a nice independent bookshop – Camden Lock Books - in the underpass to Old Street station. Not a fantastic crime fiction section, but a good selection of literary fiction, and a good vibe. I limited myself to four books: John Harvey – Rough Treatment; Ken Breun – London Boulevard; Majs Sowell and Per Wahloo – The Man Who Went Up in Smoke; Jim Thompson – The Killer Inside Me. Looking forward to reading those. Catherine Ross moved to the Shetland Isles shortly after her mother’s death. Worldly wise and aloof, and let roam freely by her grief stricken father, she observes the islanders through the lens of her camera. On New Year’s Eve she travels home with a local girl her own age, Sally Henry, a shy, self-conscious girl who has never quite fitted in at school. On a dare they stop at old Magnus Tait’s cottage. A bachelor crofter, Tait, a simple man with learning difficulties, has been ostracized by the local community after the disappearance of a small child several years before. The following night, Catherine Ross disappears, her body discovered the morning after in the snow in the field opposite to Tait’s cottage by another blow-in, artist Fran Hunter. Inspector Jimmy Perez starts a murder investigation, soon joined by a team flown-in from Aberdeen. The locals are convinced of Tait’s guilt, but Perez has an open mind in the absence of any compelling forensic evidence. Piecing together the life of Catherine Ross though is no simple matter as she has managed to rile a number of people all of whom have something to hide. Raven Black is compelling read. The plotting is strong and the prose nicely structured. Rather than follow the story from a single perspective, Cleeves elects to produce a multi-stranded narrative. The result is a multi-layered and textured story and a sense of being immersed in a community. Cleeves is particularly good at penning her characters and evoking a sense of place. The police procedural elements are realistic without the technical aspects being dwelled upon and the social relations between the cast members are believable. For a long time this was a 5 star read. I did, however, feel slightly let down by the end. On reflection, I think my issue was that the motivation of the killer was not really fully explained, nor why the victim did not fight back. Otherwise, this was a very fine read and I’m looking forward to tucking into the next book in Cleeves’ Shetland series. Since I'm flying to London this morning I thought I'd check out the crime fiction in the airport book shop and perhaps buy an impulse buy. There were two full book cases, but unfortunately very little choice. The shelves were made up of multiples of the same authors - Lee Child, Harlen Coben, Martina Cole, Michael Connolly, PD James, Linda Fairstein, Tess Gerritsen, James Patterson, Kathy Reichs, Karin Slaughter. Perhaps 50 titles between them. Nothing against these authors, but it would have been nice to have some choice and variety. Perhaps two titles per author and the books of 20 others would have help to balance things out. Surprisingly for an Irish airport, the Irish choice was limited to Tana French, Alex Barclay and Paul Carson. Given the amount of quality Irish fiction on release at the minute you would have thought the shelves would be groaning under titles by Brian McGilloway, Declan Hughes, Alan Glynn, Arlene Hunt, Jane Casey, Gene Kerrigan, etc. Very disappointing all round. Hopefully I'll get time to poke my head in a bookshop in London and pick up a couple of books. Inspector Aurelio Zen is recovering from a car bomb attack, hiding out under a false name in a small beach resort, waiting to testify in a mafia trial. His peace is disturbed when a man is found dead occupying his beach lounger. It seems that his anonymity is not as well protected as the police believed and he is immediately moved. The problem is, wherever he goes, people keep dropping dead in mysterious circumstances. When the mafia trial falls apart, it seems that the threat to Zen has disappeared, only somebody has forgotten to tell his would be killer. 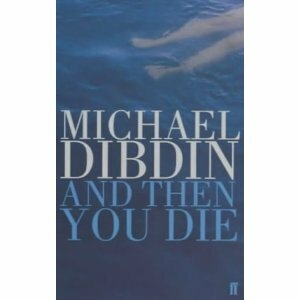 And Then You Die is a novel of two halves. The first half is an enjoyable enough read. 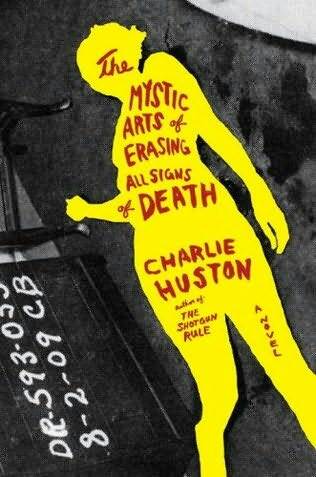 A little slow, but interesting enough, with some nice prose and observations, and solid characterization. The second half was very disappointing. The plot, which had been okay, suddenly becomes ridiculous. And rather than there just being one strange flaw, the rest of the book is full of them, compounding the problem (and the issues are not just small, niggly things, but crucial plot devices that are simply not credible). The pace shifts from being steady and sure to a mad rush to the end, and the charactization swaps to caricature. I really don’t understand the reason for this. It was if the author had made it half way through the manuscript and then suddenly stopped believing in the story and wanted to get it over as soon as possible. A real shame as the first half was good. The second half though was a real let down. 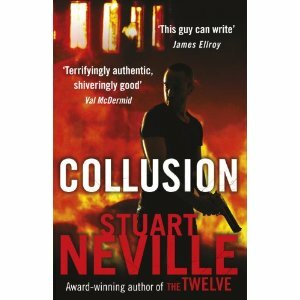 I've just bought a copy of Stuart Neville's Collusion and am looking forward to reading it. I read the opening section in the book shop and its one of the strongest starts I've read for a while. He nails the initial hook. I also picked up Patrick McCabe's The Stray Sod Country. 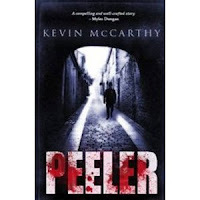 Along with Kevin McCarthy's Peeler, Christmas reading looks like its going to be dominated by Irish authors. Will stamp duty changes get the market moving again? Charles Latimer is a former university lecturer turned crime novelist. On a trip to Istanbul he makes the acquaintance of Colonel Haki, the head of the secret police. Haki thinks he has an excellent plot for Latimer’s next book, but the author is more interested in the master criminal, Dimitrios Makropoulos, lying in the local mortuary having been stabbed and dumped in the river. Dimitrios first came to the Turks attention in 1922 after the murder of a jew in Smyrna (now Izmir, Turkey) just prior to the great fire that destroyed what was then largely a Greek settlement. He escaped to Greece and then was implicated in the assassination of a Bulgarian politician, and later spying for France in Yugoslavia, before running a large drugs cartel in Paris. His attention piqued, Latimer decides to construct a biography of Dimitrios, trailing across Europe in search of clues as to his identity and activities. His journey soon mutates from fascination to obsession as he slowly uncovers Dimitrios’ quest for money and power as he works his way from fig-picker, to thief, murderer, pimp, spy, slave trader, drug dealer and eventually financier. It seems, however, that his enquiries have aroused the interests of other parties, and he is soon caught up in a web of intrigue that surpasses the plotlines of his own highly imaginative novels. 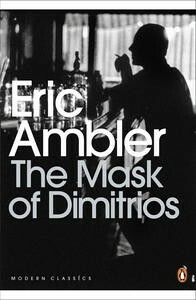 Eric Ambler is considered one of England’s finest spy thriller writers preceding the post-war and cold war chroniclers such as Len Deighton, John Le Carre, Ted Allbeury and others. The Mask of Dimitrios has a remarkably contemporary feel, dealing as it does with geopolitical tensions in the Balkans and transnational criminal networks trading women and drugs, and yet it has a historical richness that places it in the late 1930s in which it is set and written. Ambler writers in an assured and economical manner, leading the reader on a well paced journey across Europe and into encounters with a variety of complex characters. The real strength of the book is its plotting and ambiguities. Latimer is neither hero nor victim, but rather an ordinary citizen that finds himself on an obsessive path that veers into a different world and its morals. Indeed, it is difficult not to conclude that the present master of the ambiguous, everyday spy thriller, Alan Furst, has modelled his writing to an extent on Ambler’s (and if I’d read the book without knowing the author I would have guessed that Furst had written it). There are a couple of plot devices that feel contrived and one of the principal characters, Mr Peters, doesn’t quite feel right (he’s a remarkably sophisticated character in terms of his reading, language skills and conduct, and yet his path through life does make these qualities unlikely). Regardless, Ambler skilfully blends history, intrigue and characters to produce a fine read. You knew where you were in a Catholic culture: up to your neck in lies, evasions, impenetrable mysteries, double-dealing, back-stabbing and underhand intrigues of every kind. With which comforting thought he lowered the blind again and dozed off. Ah, an explanation for the crisis in Ireland and the lack of any real sense of emergency or protest. It's a cultural thing - the crisis is just normal practice magnified. I'll post a review of the book next week some time. Poor character development, with stock characters, caricatures and stereotypes (I don't mind this in certain kinds of novels, such as comic noir, but not in anything rooted in any kind of realism). The D-Day landings at Normandy on the 6th June 1944 were the largest seabourne assault ever attempted. As a result, there are dozens of books that focus on the military planning, the assault itself, and the vital first days that proceeded. David Stafford takes a different approach in two ways. First, he focuses on the ten days leading up to assault and the complex web of plans, deceptions, logistics and manoeuvres to get a quarter of a million men across the English Channel and yet still surprise the enemy in terms of time and location. And second, he tells the story from the multiple perspectives of different actors including a resistance fighter and two SOE agents operating in France, a resistance organiser in a Norwegian jail, a Jew being hidden in a Parisian apartment, a double agent feeding misinformation to the Germans and his handler, a Wren working as a decoder, an allied weatherman, a Canadian soldier, an American paratrooper, a German soldier, and of course Churchill, Eisenhower, De Gaulle, Hitler and Rommel. The result is an interesting biographical story of the lead in to D-Day and how the preparations and assault affected the lives of ordinary citizens and soldiers, as well as the principal leaders. The real strength of the book is its biographical weaving of the narratives of individuals and setting those within the wider context of the war and its political framing. Where the book is perhaps weakest is the choice of some of the individuals. 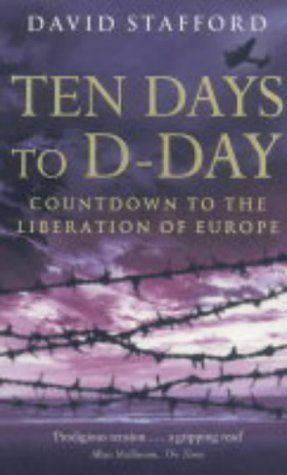 The account of the Norwegian resistance organiser’s time in jail is interesting, but has no baring whatsoever on the D-Day landings, and indeed he knew nothing about them and played no role in the lead up to them. The German soldier similarly played no direct role in D-Day being posted a long way behind the front. It would have been good to have included some other characters that were more centrally involved. The other issue is that the book does feel as if it ends too soon. We get the lead in to the main event, but get very little of the event itself and what follows. The reader is warned by the title that this would be the case, but it does feel that the story is too truncated. Overall, a fascinating read that needed a little fine tuning. The economy has been firmly shoved off the lead item on the Irish news. It is dominated by two things. First, the big freeze and the snow and ice that has half paralysed the country. I saw a nice interview with a Polish woman on TV yesterday. The interviewer said that she must be used to such conditions. She half-agreed. She was used to the snow and ice, just not a country grinding to a complete halt because of it. Second, whether Mary Byrne will manage to survive through to the final of X-Factor (the reality singing contest in the UK). Snow and celebrity overtaking economy is a welcome relief; there is life beyond the IMF. A slow month for reviews, but a good quality month of reading. Very difficult to pick a book of the month between Vanilla Ride and Small Crimes as both will be in my top ten reads of the year. 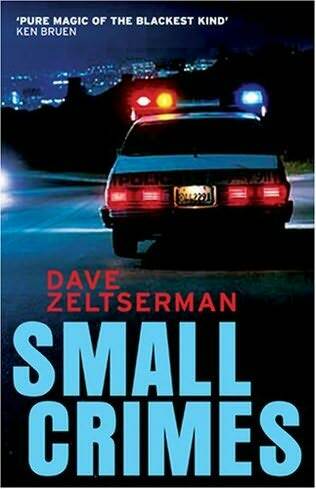 I'm going to go with Small Crimes. Vanilla Ride is a blast and Hap and Leonard a hoot, but Small Crimes kind of rattles round in the memory and has a great end. We're splitting hairs here. I had an opinion piece in The Irish Times this morning on unfinished/ghost estates, and the IT is a good place to take a look at for a sense of things. Simon Kelly started in property development as a teenager, crunching the numbers for his father, Paddy Kelly, one of Ireland’s best known developers. He quickly progressed to become his father’s right hand man and eventual partner, specializing in the financial and legal side of the business. In Breakfast with Anglo he tells the story of the Irish property boom from the developers’ perspective, providing a reasonably frank account of how the property development game worked, focusing especially on the finance side of things and the relationship between developers and the banks, especially Anglo Irish Bank. Breakfast in Anglo is a curious read. Kelly has produced a candid, seemingly open, and engaging narrative. Whilst many elements of the story will rile many readers, Kelly has clearly been on a journey of self-reflexivity and he’s able to step back a pace and set out the ins and outs of the business, his role in it, and to acknowledge his culpability and express remorse for the ensuing disaster of the collapse of the Celtic Tiger. That’s not to say that Kelly is full of regrets, though he has a few, or that is he rounds on his former colleagues and partners, or is apologetic for his lifestyle or the fact that he knows how to work the system and does, including walking away or sheltering from massive liabilities. Indeed, it’s clear that even now he has a soft spot for Anglo Irish Bank and many of the staff who worked there, and he’s generous in his praise of those he worked with. However, by wearing his heart on his sleeve and being straight, the result is a book which as much as one would like to hate it, and as much as the story annoys and riles, and for all its faults and silences, one has to admit was a pretty good read. That’s not to say that there aren’t issues with the story being told, but that the writing craft and narrative was solid. As for the story. Breakfast with Anglo principally tells the financial and deal making side of the building of the Kelly’s property empire. 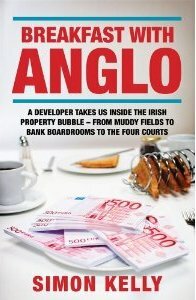 In particular it focuses on the relationship between the Kellys and Anglo Irish Bank, how they built a complex web of partnerships with other developers and financiers to make different deals work, and how the nature of development changed throughout the boom years. Told from Kelly’s personal perspective it also reveals how he changed as the business grew and became increasingly disillusioned by the life he was living, but ultimately was unable to extract himself from it. Where the book is strongest is in its insight into the way in Anglo, the other banks, and the deal making side of development worked. Anglo built relationships that extended beyond simply servicing business. It cultivated its clients, gave them royal treatment, bent over backwards to help them out and make financing as easy as possible, but in return demanded loyalty. They became the bank of choice for developers because they actively facilitated them by building a relationship, cutting through red-tape, and were reactive to their needs. They also didn’t impose ‘silly rules and restrictions’ as Kelly puts it, by which he means sensible and prudent rules and restrictions. Where the book is almost completely silent is with respect to politics, vested interests and planning. Not one single politician makes an appearance in the story. The much talked about cabal in the media is developer, banker, politician. Either the Kelly’s had nothing to do with the politicians or political donations or political lobbying, or this is conveniently dropped from the narrative. And whilst Simon Kelly might not have been actively and directly involved in this, one would find it hard to believe that he wouldn’t have known what other elements of the firm were up to given the level of interaction and family and partner plotting. Neither is the role of vested interest groups such as the CIF much discussed and the role of developers in shaping the policy landscape around planning and tax breaks. And the book is pretty mute on the business of securing planning permissions and working the planning system and bullying local communities through threats of compulsory purchase orders and the like, other than a couple of short notes. There are hints at how developers played the tax incentive schemes and avoided capital gains tax and stamp duty, but these are in passing and there is no in-depth discussion as to how these were played and exploited. The story then is selective, rather than the full warts and all promised. For the book to have been the full expose of what went on, then all these issues needed to be explored in depth. At the end of the book, Kelly provides ten lessons for the boom. Interestingly, they all focus on what a developer should remember in order to be successful and avoid crashing. None of the ten lessons focuses on what Ireland should do to avoid future boom and bust – no mention of the Kenny Report, nothing about financial regulation, nothing about a more robust planning system, nothing about political reform, and so on. Ultimately, Kelly cannot see beyond the developer horizon. If after being at the centre of the property development boom and bust, the ten lessons are simply about protecting developer interests, one ultimately feels that despite his self-reflexive soul searching, Kelly hasn’t learnt a lot beyond self-interest. And he is one of the developers who isn’t still in denial. Unless the cabal of developers, bankers and politicians can start to see the bigger picture beyond their own interests, then one anticipates reading a similar book by a Kelly-wannabe or the next generation of his family in 30 years time. Overall, a book as interesting for its silences as for what it has to say about property development in Ireland, but an engaging read nonetheless.